“The scarcest commodity in the business world is attention. If you’re a boring speaker, the audience will check their emails or think about where to have dinner tonight. To grab the audience’s attention, you need to keep them engaged“. You have delivered good presentations before, but recently, you don’t know how to take your public speaking skills to the next level. This happens to the best of us — even pros who consistently get paid to speak. However, successful entrepreneurs keep speaking. They may find it challenging to give a great TED talk, but they still speak. Again, and again, and again. They aren’t superheroes, and they don’t have magic powers. So what is the secret? Their success comes from their public speaking habits. If you’re stuck and frustrated with your progress, then copy from somebody else — either content, delivery or both. I’m not talking about real copying, of course — it’s more like learning from what successful entrepreneurs do. Done right, this can quickly improve your public speaking skills and help you position yourself as an authority in the industry. Most entrepreneurs worry, “How will I look on stage?” They focus on themselves. Successful entrepreneurs think differently: they don’t focus on themselves, they focus on the audience. 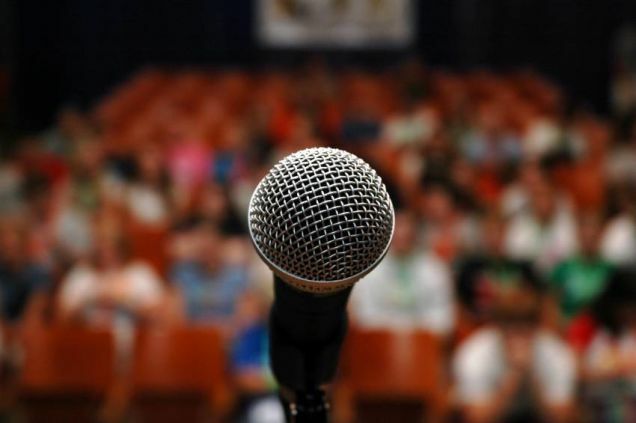 World-class speakers ask, “What do I want the audience think, do or feel differently after my presentation?” Focus on sharing your message with the audience and you will become more successful. The scarcest commodity in the business world is attention. If you’re a boring speaker, the audience will check their emails or think about where to have dinner tonight. To grab the audience’s attention, you need to keep them engaged. One easy way is to engage people’s emotions: ask questions, tell stories or play a short video. The more engaging your presentation is, the more attention you can get from the audience. Have you ever heard presenters using buzzwords such as “leverage” and “synergy” to make themselves sound more professional? These words are meaningless. Successful entrepreneurs avoid buzzwords. They use simple words to make sure that everyone understands what they say. To get your point across, use simple words that even a 10 year old can understand. Stories are powerful because they engage people’s emotions. When you engage people’s emotions, they will pay attention and be inspired to take action. Stories help you stand out from the crowd. The best stories are usually from your personal experiences because you know them best and nobody can challenge you. Successful entrepreneurs use slides differently. Instead of bullet points, they use pictures. Garr Reynolds from Presentation Zen shares the idea of using more visuals and fewer words. Make sure every slide has one picture that expresses the whole idea and use as few words as possible. This simple approach will make your presentation more memorable. The key to peak performance is coaching. Even personal development legend Tony Robbins has a coach. World-class entrepreneurs never stop learning because they want to be on top of the industry. If you are not learning, you’re dying. Even top presentation experts keep learning. They read new books, attend seminars and watch TED Talks to advance their skills. You can use any of the habits described in this post to start improving your public speaking. So go out there and start speaking! Jonathan Li helps online entrepreneurs speak with confidence. He is the Amazon bestselling author of Secrets of the Confident Speaker: Mastering the Inner Game of Public Speaking. You can grab his effective and powerful training for free at ExpressiveLeader.com.